Greg McElroy Joins ABC/ESPN Saturday College Football Booth; Dave Pasch & Bob Wischusen Extend Deals with ESPN - ESPN Press Room U.S.
ESPN has secured extensions for two of its top college football voices, as well as added Greg McElroy and Allison Williams to the Saturday ABC/ESPN commentator teams. ESPN play-by-play Dave Pasch has re-signed and will be joined in the booth by analyst Greg McElroy, and field analyst Tom Luginbill. Reporter Allison Williams will join the team of Brock Huard and Bob Wischusen. Wischusen has also extended his contract with ESPN. With more than a decade of experience at ESPN, Pasch and Wischusen have both inked new deals to continue at the network. Pasch joined ESPN in 2003 and has served as a play-by-play commentator for college football, men’s and women’s basketball, the NBA, the WNBA and the Little League World Series. Wischusen is going into his 12th season at ESPN. He’s served as a play-by-play voice for college basketball and football since 2005. McElroy is transitioning from SEC Network’s traveling pre-game show SEC Nation to a weekly regular-season game assignment. 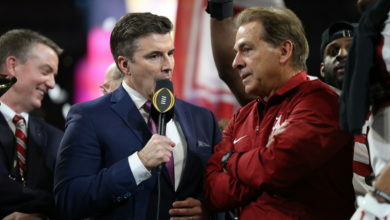 The former national championship winning-quarterback has served as a college football studio analyst for the past two years, in addition to covering several spring games, bowl games and two regular-season games. He will join the returning team of Dave Pasch and Tom Luginbill for an ABC or ESPN Saturday game. McElroy will also continue to contribute to SEC Network’s studio show SEC Now throughout the week. Williams, who previously worked Friday night college football games, is moving to the Saturday slot on ABC or ESPN with the crew of play-by-play commentator Bob Wischusen and analyst Brock Huard. Williams joined ESPN in March of 2011, covering college football and college basketball.